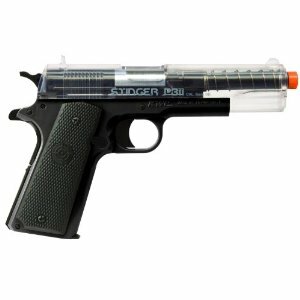 The Stinger P311 airsoft gun is a look-alike of the famous Colt 1911; from the block iron sights, to the simple look of the gun. At only $10-$20 (depending on where you buy it), this pistol also packs a punch. One of the cool features of the Stinger P311 is the hammer. Most airsoft guns don’t have hammers, but lately Crosman (the maker of this gun) has been incorporating them into their pistols, adding to the realism. When you pull the slide back the hammer gets cocked back also, just like a real gun. You can manually pull back the hammer, too, and it’ll just snap back in place when you pull the trigger; although it won’t fire if you do that, since you have to pull the slide back to get it loaded. So, really, the whole point of the hammer is just decoration. This pistol also packs a punch, for what it’s worth. It shoots 325 FPS, which is just about as high as it goes with spring pistols (without modifying it, that is). A problem, though, with the Stinger P311 is the hop-up is nonadjustable, which means you’re stuck with however tight it was wound in the factory. Basically, at ranges over 30 feet, the Stinger P311 tends to shoot straight for about 20 feet, then take a dramatic turn either go left/right/up/down. You can’t really count this as a “con”, though, because almost every pistol is going to have the same problem, more or less. A solution to this problem is to shoot .20 gram BBs; they’re heavier than the regular .12 gram, so they tend to curve less. In really bad cases of curving BBs, you could even use .25 gram. Another flaw is that it’s big, which would be a problem if you wanted to stick it in your pocket or something. But, this is another non issue, because you can get a holster for under $10. Besides, in the world of spring pistols, in order to have high FPS, it has to be a big gun. For it’s price, the Stinger P311 has very nice workings. The slide pulls back quickly and cleanly, which results in shorter time between shots. The magazine also ejects out very quickly. With some airsoft pistols you have to push the magazine release while shaking the gun to get the magazine to fall out. The Stinger P311’s magazine springs out, which also makes for quick reload times. The flaws in the magazine are that is has no reserve, which means you might want to buy extra clips, due to not being able to refill from the magazine itself. Also, if you can’t do tactical reloads, because (if you take out the magazine while it still has BBs left in it) a couple BBs will fall out, all over the ground. And, another part to think about is the safety. It’s located on the left side, just above the grip. It’s shaped like a triangle, and it pivots on one of the points. You flip it up and down to turn on and off the safety. Because of its weird design, not many people are used to it, so it doesn’t feel natural to turn off/on the safety. Some people like the design, and some people hate it, it’s up to your personal preference. To conclude, the Stinger P311 is a great sidearm for both target shooting and airsoft matches. It boasts a high FPS, but is best used at ranges under 30-40 feet. Also, think about buying a holster and some heavier ammo along with this gun. Factoring in the price, performance, and overall utility of the Stinger P311, it’s one of my favorite spring pistols to use. This entry was posted in Beginners, Intermediate, Pistols, Review, Spring/Bolt Action, Video and tagged airsoft, airsoft 1911, airsoft pistol, colt 1911 airsoft gun, colt 1911 look-alike, crosman, crosman colt 1911, good airsoft guns, good airsoft pistols, p311 video, powerful spring airsoft pistol, review video, soft air, stinger p311, video, youtube by sirbuffalosushi. Bookmark the permalink.